We offer a number of options to replace or upgrade your foam and boat cushions. Choose from our FloTex closed cell flotation foam, drainable outdoor foam, economical foam, memory foam, or all natural foam called latex. Then, combine them with a beautiful new fabric such as Sunbrella ®, vinyl, or send us your own material. Buy full sheets of foam at reduced prices and cut your own boat cushions. For memory foam and natural latex foams visit our foam toppers page and natural foam pages to purchase full sheets of these foams. You may also find some discount foam in our clearance section. 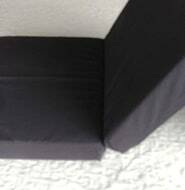 To generate a boat cushion quote, all you need are your dimensions and to click on a shape below. You will need to select what type of boat cushion foam you are interested in. Outdoor foam is great because it doesn't absorb water, drains immediately, and lasts a long 10 years. FloTex is a firm certified flotation foam. Natural latex foam comes in several firmness choices. It is an all natural foam and resistant to mold and mildew. It should be ordered using standard size blocks or you'll pay a premium for custom cuts below. Memory foam is a great top layer for comfort but needs to be used with a firm bottom foam layer for support. Both memory foam and regular foam cost less than natural latex, but are synthetically derived byproducts from oil. If you have questions or need help, please call one of our sales professionals at (415) 503-1188 to help assist you in building the boat cushions of your dreams! Select the shape below that closest resembles what you would like to order. Then enter your dimensions to see prices for all foam qualities and custom sewn cover options. Boat cushions with a hinge make it easy to access storage under v berths. Consider adding a hinge to your boat cushion. You can use three types of foam for cockpit cushions: your regular foam, outdoor foam, or Flotex closed cell flotation foam. By clicking the shape above you'll get a quote on our outdoor foam, regular foam, and Flotex foam. Most boat cushions will match one of the shapes above and will not require a pattern. To begin, take a minute and review how your existing boat cushions look. This is your chance to correct any gaps and make improvements. Next, using paper, plastic, or fabric to make the pattern, simply cut your pattern to the exact sized desired. The more precise the pattern you provide will result in a more exact fitting boat cushion. (For local customers we'll come and template every boat cushion needed for a flat $150 fee.) Please mark on your pattern "This side up" and which side(s) should be used for zipper placement and stripe direction. Keep in mind that most large v berths work best with a zipper wrapping around three sides. Always mark the pattern for zipper placement on the hull side. For a price quote, use the pattern shape and enter in the largest dimensions (thickness, length, and width) from your old boat cushions. You can save money by cutting foam for v-berth boat cushions using less foam. If you were to simply cut your boat cushion pattern from a large block of foam it would start like this. Since you pay for foam by volume, if you use less foam, it will cost less. You can save foam and cost by laying the v-berth boat cushion pattern out like this. Only use the larger top pattern if there is a bevel. The center cut out will be seamed together. Always separate each half of the v-berth mattress pattern by 1.5". A bevel is added and the final cut boat cushions look like this. A lot of old 1970s shag fabrics were so heavy that you didn't need to worry about wrinkles in the material. Boat cushions covered with lighter fabrics such as Sunbrella ® and micro fiber are thinner and show wrinkles. There are two ways to reduce and eliminate boat cushion wrinkles. Without changing any of the dimensions, add a polyester batting wrap to the top and bottom of your foam. This is the most effective method. It also adds a breathable layer between your body and the foam. Reduce the thickness of the case by 1/4". This option just reduces the amount of wrinkles present. Most foams may be exchanged if you don't like the density you have chosen. See exact details during checkout. Boat interiors are frequently moist. This moisture gets trapped between your cushions or mattress and the boards below. To help avoid problems with mold or mildew, air your mattresses or cushions outside in the sun every couple of days but don't remove the covers. When you are not using your boat, store your mattresses or cushions vertically in the aisle. For added protection, you can sprinkle anti-fungal powder (found in most drug stores) on the platforms below your mattress or cushions, as well as on the bottom side of the cushions. On my liveaboard boat. The most comfortable boat matress I have ever slept on in 50+ years of sailing. Perfect custom cut foam mattress replaced my old innerspring boat mattress -- thank you! Worked with Steve to convert a king-size mattress to the exact template of our v-berth mattress for our boat. Very fair price for the mattress, custom cutting and mattress cover. Very happy with the product and service. The pre-cut foam I ordered from my submitted pattern was perfect. I am reupholstering my dining room chair covers. I always receive the highest quality from Foam Order. As a professional (now retired) seamstress my customers were also very satisfied with the foam I used from Foam Order. I revived many seat cushions, boat cushions, couches and a few antiques. I highly recommend Foam order without reservation!